October 20, 2014, 9:46 AM · I heard someone state that "if Midnight Syndicate ever stopped producing music, Halloween would have to be cancelled." I thought that comment was a bit over the top until I saw them perform at Cedar Point in their first live stage show, "Legacy of Shadows" at the Ghoul Time Theatre (Good Time Theatre the rest of the season, still known by many as the Cedar Point Cinema). HalloWeekends at Cedar Point will never be quite the same for me. Edward Douglas and Gavin Goszka are the current members of this remarkably talented, uniquely creative musical duo. The darkly gothic instrumental sounds they create with a few keyboards have, in little more than a decade, become the music that means "Halloween" for films, haunted houses, and now amusement and theme parks across the country. Cedar Point has scored a coup in bringing Midnight Syndicate to perform live on stage for the first time for the thousands of guests who each fall weekend brave the often cold, windy and (while we were there) drizzly Cedar Point site. The huge stage of the Ghoul Time Theatre is filled with an appropriately creepy set reminiscent of an abandoned mausoleum, with crumbing tombstones, evilly-lit stained glass windows, forbidding mist and a full moon that rises up behind the structure as the show begins. Large video screens flank each side of the stage and are used throughout the performance, including before it starts as a video technician projects a live feed of the guests as they arrive in the theatre, with an occasional technical "glitch" that foreshadows much of the performance to come. Midnight Syndicate Live! 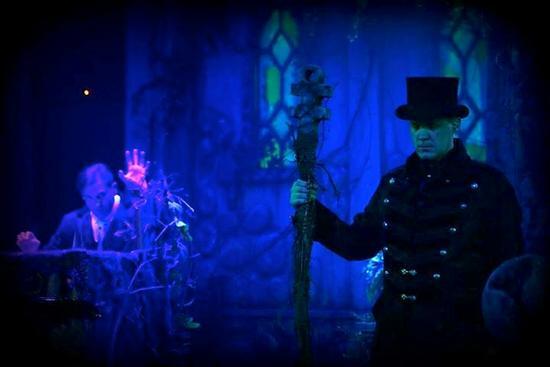 Legacy of Shadows, performing at HalloWeekends in October 2014. Photo courtesy the artists. The performance itself lasts about 25 minutes, and while there is not a true plot to it, there is a progression of a theme that carries the audience from being mere observers of the talented Edward and Gavin on stage to being subtly involved in a theatrical experience that soon involves both the audience and the entire Cedar Point park outside the theatre. The use of films and live video feeds projected onto the screens flanking the stage, special effects using fog and lasers, a talented female singer who would appear and add her beautiful but appropriately sinister voice to the music, and the omnipresent darkly-gothic music that is Midnight Syndicate made the performance one of the most memorable Halloween events I have ever seen. I won't spoil the surprises, and there were many surprise moments that had the audience jump a bit, but suffice it to say that few if anybody left "Legacy of Shadows" feeling that they had not gotten a good dose of Halloween scares. Edward and Gavin were waiting outside of the theatre in a "meet and greet" area, where guests could purchase CDs, posters and other Midnight Syndicate merchandise along with meeting the musicians. I found that these two talented performers, -- whose on-stage personas were creepy bordering on evil -- were charming, friendly and loved to pose for pictures with audience members, a complete difference from what I had expected. They are truly talented performers. I hope that Cedar Point and Midnight Syndicate have many more years of working together, creating unique theatrical experiences that stand out at Cedar Point and make HalloWeekends one of the premier Halloween events in the amusement park world. October 20, 2014 at 12:11 PM · I wasn't quite sure what to expect from the show but I was pleasantly surprised by the inventiveness of the presentation, particularly the finale. Without spoiling anything, it's a testament to how much a great concept doesn't have to cost a ton of money to make a big impact. October 22, 2014 at 1:22 PM · Just loved there show. The music is really outstanding, I bought there CD/DVD combo set(2CDs and a DVD which they did the sound track on. The movie is "The Dead Matter" and the DVDs the Move Soundtrack and Halloween Music), all of which is great! I've seen it 5 times and each time you see or here something new. I sure hope Cedar Point keeps them around too.